Once in a while, a journalist will ask a question that really makes me think. Such a question arose recently, when I was asked whether Missouri’s House Bill 1472—which I earlier said “would eviscerate the teaching of biology in Missouri”—was the worst antievolution bill to come down the pike in a long time. At first, I was inclined to respond by saying that they’re all horrible, which indeed they are. But pondering it further, I realized that there was enough survey data available for me to make a back-of-the-envelope estimate of the expected effect—measured in lost student-hours of effective evolution education—of the two antievolution bills currently before the Missouri General Assembly. 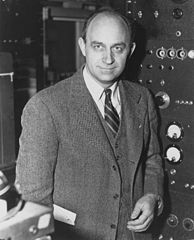 Such estimates are sometimes called Fermi estimates, after the Italian physicist who famously estimated the yield of the Trinity A-bomb test accurately by observing the movement of scraps of paper; hence the title of and the illustration for the present post. That question is a plausible proxy, but not a perfect one. On the one hand, what you tell a pollster about your preference may not reflect what you would choose if you really had a chance to act on your preference: maybe not all of those 20% would really vote to ban the teaching of evolution. On the other hand, Gallup was asking about what you would prefer for all children in the public schools, not about what you would do about your child alone; you might think that it’s okay for evolution to be taught in the public schools in general as long as your child in particular isn’t required to learn it. Yet again, parents who are really worried about their children learning about evolution may have already removed them from the public schools, in favor of private religious schools or home schools. All in all, it’s hard to judge. Let’s say that about 10% of parents in children in Missouri’s public schools would avail themselves of the option if HB 1472 were enacted. In 2010–2011, there were 275,719 students in grades 9 through 12 in Missouri’s public schools, according to the National Center for Education Statistics. Let’s say that about one in four of them takes a biology class in any given year. (Perhaps there is more than one biology class, like biology and Advanced Placement biology, but then again perhaps not every student takes even a single biology class.) So 10% of these students would be excused from learning about evolution at the request of their parents under HB 1472: that’s about 6,900 students. According to the National Survey of High School Biology Teachers conducted by Michael Berkman, Julianna Sandell Pacheco, and Eric Plutzer in 2007, the average time devoted to evolution in a high school biology class is 13.7 hours. So the total cost of enacting HB 1472 would be about 94,000 student-hours, or a shade under 11 student-years. Second, let’s consider House Bill 1587, which would deprive administrators of the ability to prevent teachers from miseducating students about “scientific controversies.” The National Survey of High School Biology Teachers indicated that about 25% of public high school biology teachers nationally discuss creationism, with about half presenting it as scientifically credible in their classrooms; about 16% of public high school biology teachers nationally preferred the creationist option (“God created human beings about 10,000 years ago”) from the options in Gallup’s question. So there are about 4% of public high school biology teachers who are creationists but who refrain from presenting creationism as scientifically credible: these are teachers who might feel empowered by the passage of HB 1587. Let’s suppose that half of them, 2%, would take the opportunity seemingly afforded by the enactment of the bill to present creationism. I couldn’t discover how many high school biology teachers there are in Missouri. But it’s not necessary, for there’s a 2% chance that a student in a high school biology class in Missouri will be instructed by a teacher who doesn’t currently present creationism as scientifically credible in the classroom but who would do so if empowered by HB 1587. Because there are about 69,000 students taking biology in Missouri high schools in any given year, about 1,380 students would be so afflicted. In the National Survey of High School Biology Teachers, the majority (88 of 130) of creationist teachers who discussed creationism in the classroom devoted between one and two hours to doing so. So let’s say that those 2% would devote 1.5 hours on average to doing so, at the cost of 1.5 hours of effective evolution education lost. Multiplying, the total cost of enacting HB 1587 would be about 2,070 student-hours, or a shade under 0.25 student-years. So the total cost of enacting HB 1472 would be about 94,000 student-hours of effective evolution education lost while the total cost of enacting HB 1587 would be about 2,070 student-hours of effective evolution education lost. That’s a difference of over one and a half orders of magnitude, so even though there’s a lot of room for error in the various assumptions involved in the calculations above, I’m inclined to think that there’s a sound quantitative basis for saying that HB 1472 is, indeed, the worst antievolution bill to come down the pike in a long time. Only bills that would actually ban the teaching of evolution, like Tennessee’s Butler Act from 1925, would outdo it. (The cost of enacting the Butler Act in Missouri today would obviously be ten times worse than the cost of enacting HB 1472.) Still, both of Missouri's antievolution bills are horrible, and I earnestly hope that both will fail to win passage.